Robert Gatchel’s research could revolutionize how the military cares for wounded soldiers. It might help thousands of disabled veterans transition back into civilian life. He may rewrite the rules on holistic health care. But he never planned to do any of that. He just wanted to be Duke Snider. Young Bob was a spellbound 7-year-old living on Long Island when Snider and his Brooklyn Dodgers upset the rival New York Yankees in the 1955 World Series. From then on, he dreamed of playing big-league baseball. And he was on his way, before fate redirected him to the big leagues of scientific research. These days, Dr. Gatchel is the Duke Snider of psychophysiology. Now 61, he is chair of UT Arlington’s Department of Psychology and one of the world’s foremost researchers of how chronic stress and pain affect the mind and body. His work has won numerous awards. He has published 23 books, 92 book chapters and 275 journal articles and garnered tens of millions of dollars in funding. Now his research is providing better care for injured veterans. Before any of this, Gatchel was a two-sport prep star in Port Jefferson, N.Y., who severely injured his knee playing football as a senior. That cost him a college baseball scholarship and forced him to re-evaluate his future. In his case, the accommodation was an Introduction to Psychology course at the State University of New York at Stony Brook. By the time Gatchel graduated, he had become “very enthralled” with psychology and enrolled at the University of Wisconsin to begin graduate work in 1969. That same year, young men fresh out of college began being drafted for the Vietnam War. Gatchel, the son of a Navy veteran, had no problem going if called. That’s a good thing, since his draft number was 49. But on the morning he was to report for a physical, his reconditioned knee began bothering him for the first time in years. Specifically, it directed him to focus on the physiological bases of psychological processes. In other words, how pain (like he felt in his knee) and stress (like he felt on draft day) affect how the brain and body perform. This branch of psychology, called psychophysiology, or cognitive neuroscience, began in the 1970s, when Gatchel first argued that you must do more than treat a physical injury; you must treat the whole patient. 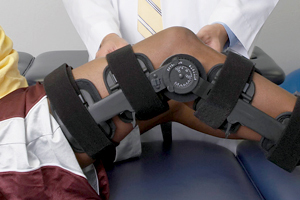 Repairing the physical damage of a knee injury may get a patient walking again, but it ignores the depression he might feel from being homebound. And it does nothing to alleviate the stress as medical bills pile up while he’s out of work. Gatchel calls it functional restoration through a “bio-psychosocial” approach. Veterans with knee and other injuries are finding relief with Gatchel’s holistic approach to pain. Eventually, Gatchel’s functional restoration approach became a preferred treatment. And he found a new application for his research when the United States began its war on terror in 2001. Because it was a new kind of war, the Army needed more mobile soldiers, which meant they had to carry everything they’d need with them. Consequently, more soldiers began suffering from back problems and injuries to the arms, shoulders, knees and ankles. Gatchel found that as many as 40 percent of soldiers out of action had been injured in this way. The Department of Defense awarded Gatchel a $1.5 million grant to see if his brand of treatment might prove more effective. He took the bio-psychosocial approach to San Antonio’s Wilford Hall, the Air Force’s large triage hospital, where he treated patients by reconditioning them. He showed them how to deal with stress, pace themselves and progressively increase their strength, range of motion and aerobic capacity. “All those things that, obviously, if you’re a soldier you have to do,” he says. As the wars in Afghanistan and Iraq went on, large numbers of troops began suffering from post-traumatic stress disorder, the disabling psychological syndrome that accompanied their physical injuries. A recent Rand Corp. report estimates that more than 300,000 PTSD cases could emerge from the current conflict. In August 2008 Gatchel received another $1.5 million grant and installed a program that combined physical rehabilitation with PTSD treatment. His project is one of eight in the Department of Defense’s $30 million Strong Star Consortium, which includes researchers from Harvard, Georgetown, the University of Pennsylvania, UT Health Science Center at San Antonio and elsewhere. Other projects in the consortium concern genetics, system functions, long-term vs. short-term consequences of injuries and individual difference injury healing. In Gatchel’s program, injured soldiers are evaluated upon arrival at Wilford Hall, both physiologically (measuring strength, range of motion and aerobic capacity) and psychologically (evaluating for PTSD and measuring coping mechanisms for anxiety, depression and social support). This bio-psychosocial profile provides a starting point for the soldier’s treatment. Once a soldier’s psychophysiological state is determined, Gatchel tailors a program specific to the soldier’s needs. It lasts 6-8 weeks and includes checkups to make sure the treatment is working. Once the program is complete, Gatchel’s team monitors the patient before it’s determined whether the soldier can return to active duty, can be accommodated elsewhere in the military or will be medically discharged. Those who must be discharged are transitioned out of the program into Veterans Affairs. Gatchel’s next step is to gather data and appraise the treatment program. Given its effectiveness in the civilian population, he believes it will work for the military, too. If it does, he hopes to make it common practice beyond Wilford Hall. “We anticipate that the outcomes of this clinical research effort will be utilized at the highest military levels to outline clinical practice guidelines for military treatment facilities,” he says. “Furthermore, Dr. Gatchel’s work may contribute to effective mechanisms for preventing the chronic onset of pain and PTSD symptoms. Not bad for a man who just wanted to play baseball.